In a country where millions have been affected by a crippling drought in the last couple of years brought on by the super El-Niño event, an absolutely astonishing shift has taken place from a drought condition to an excessively wet situation” and there have been heavy (rain) falls that have surpassed all previous years. The situation was exacerbated by Tropical Cyclone Dineo in mid-February. The government of Zimbabwe has appealed to international donors to help those affected by floods in the country during the 2016 to 2017 rainy season. 246 people have died, 128 people injured and approximately 1,985 made homeless by flooding in the country since October 2016. The country’s Civil Protection agency reported a few days ago that another 859 people remained displaced after flooding in Tsholotsho District in Matabeleland North, where the Gwayi River and its tributaries burst their banks in the latest deluge. Across the country as a whole, the minister, Mr. Kasukuwere said that over 2,500 homes have been damaged since October and some communities are still cut off by the floods. Roads, schools and health facilities have also suffered damage. The districts of Mberebgwa, Insiza and Lupane have suffered major road damage. Full damage assessments are yet to be carried out in some areas that remain inaccessible due to flooding. 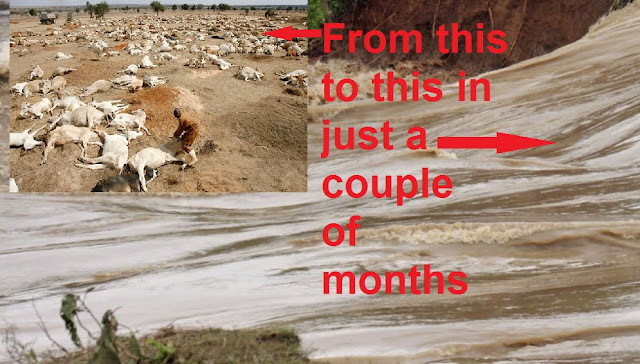 And as is happening this month in California, Mr. Kasukuwere added that “85% of dams in the country are full and spilling, thus even low amounts of rainfall will cause flooding.” Around 70 small and medium sized dams have already been breached. Just last November it was reported that Zimbabwe's dam levels had fallen to below 40 percent following the devastating drought that has left millions in need of food aid and local councils rationing water, Vice President Emmerson Mnangagwa said on Friday. An El Nino weather pattern, which ended in May, triggered drought conditions across the southern African region that hit the staple, maize, and other crops and dented economic growth. Mnangagwa said the last time Zimbabwe experienced such a severe drought was in 1992, adding that the biggest dam in the south of the country was only 9 percent full.